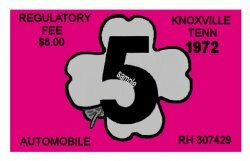 1972 Tennessee INSPECTION Sticker (Knoxville) - $20.00 : Bob Hoyts Classic Inspection Stickers, Add a Final Touch to your Restoration! Tennessee did not have state inspection stickers but they did have city and regional inspections like the one listed here. Our thanks to Bob Lee, Knoxville, for providing us with the original image. we have restored this 1972 sticker used in areas back in the 50's and 60's from a similar Safety inspection sticker. These stickers were issued by car dealers and also garages after repairing a car pulled over for defective equipment. For an additional $5.00 buyer may choose the desired month (NO.) on the sticker.